instrument and knife at their suburban family home, where he stayed for a few days before handing himself over, Australian police said on Monday. 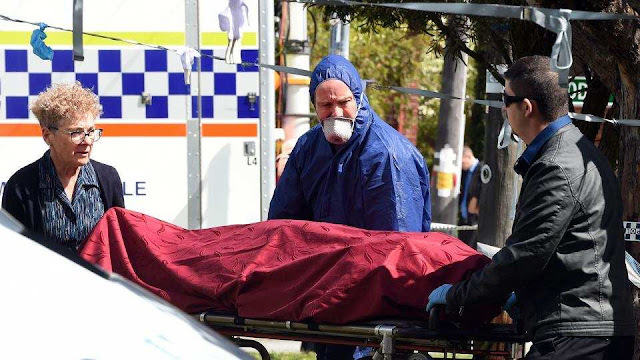 Police accused Anthony Robert Harvey of the killings of his two-year-old twins Alice and Beatrix, his three-year-old little girl Charlotte and his 41-year-old spouse Mara in the south-western city of Perth. Western Australia Police Commissioner Chris Dawson told reporters no firearms were used in the attacks which police believe were carried out with several weapons including “a blunt instrument and knives ”. “The mother Mara and her three children were all murdered over a period of time on the third (of September), and that Mrs Quinn was murdered the following morning.” Dawson said the two women were allegedly attacked in the kitchen while the children were killed “in other rooms of the house”. “We are alleging that Mr Harvey remained at the... house for some days” before heading north, he added. Police found the bodies of the five victims at the unassuming detached family home after Harvey walked into a police station in a remote mining area some 1,500km north of the city on Sunday – a week after their deaths. Harvey is expected to return to court on Sept 19.